In 1963 Thich Quang Duc burned himself to death in a busy intersection of Saigon, Vietnam. He was protesting against the persecution of Buddhists by the South Vietnamese government led by Ngo Dinh Diem. 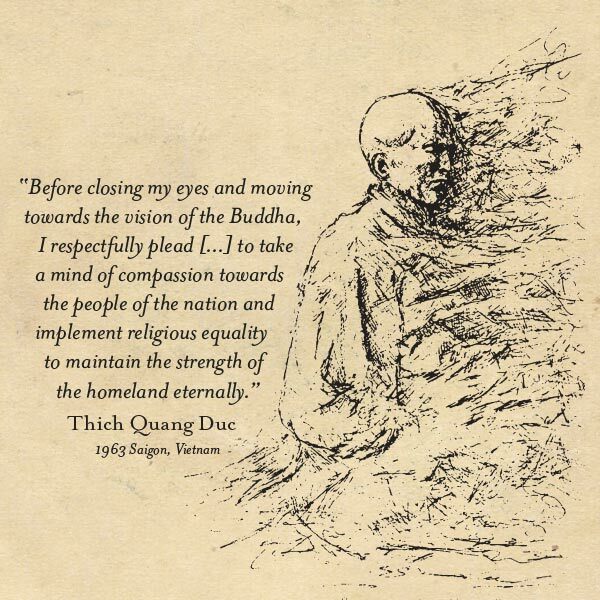 Quang Duc’s public display drew international attention and became the turning point in a growing crisis. Diem lost U.S. support and his government was eventually overthrown in a coup. A photo taken by Malcolm Browne won him a Pulitzer Prize for International Reporting. President Kennedy said of the photo, “No news picture in history has generated so much emotion around the world as that one”. This vector art is made from an illustration based on the famous photo. The illustration was originally from the site “tomatocow.com”, which isn’t around any more. As such, this free vector is for personal use ONLY. I share it with deepest respect for the subject. Historical facts courtesy of wikepedia.